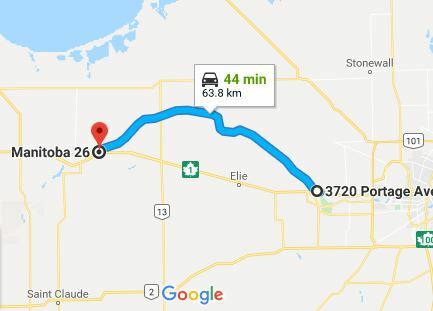 PTH 26 runs east-west, following the northern edge of the Assiniboine River, beginning and ending at PTH 1, starting in the RM of St. François Xavier and ending just before Portage la Prairie. Click here to show the route. The highway carries mostly light residential and farm traffic and is often used by cyclists in the summer months for that reason. There is a narrow paved shoulder from the eastern junction of PTH 1 that lasts past Pigeon Lake, where the highway narrows and the pavement becomes rougher. This route was originally part of the Trans-Canada Highway before the present day PTH 1 route was constructed south of the Assiniboine River. 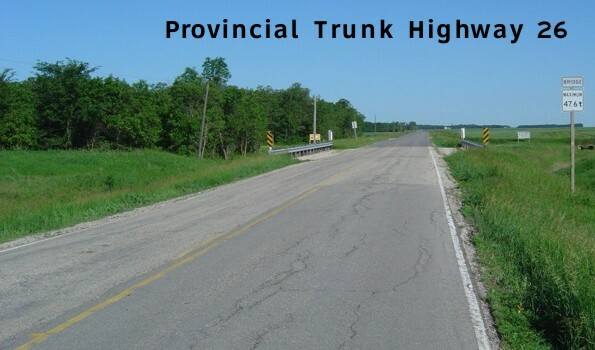 It was then renumbered as part of PTH 4 that connected with the Yellowhead Highway west of Portage la Prairie and the present day PTH 44 north east of Winnipeg. In the late 1960's, it was renumbered as PTH 26, which remains in effect to this day. Eastern Terminus: Junction of PTH 1 in the RM of St. François Xavier. Western Terminus: Junction of PTH 1 in the RM of Portage la Prairie just east of the junction of PTH 1 and PTH 1A. Multiplexes: PR 248 follows PTH 26 for approximately 2 km between Marquette and St. Eustache near the Baie St. Paul Bridge.